Although I have to say that I'm not too sure about sticking with the show after 11 Seasons. It took a lot for me to give CSI a chance when William Petersen left the show. Laurence Fishburne did a fantastic job as his replacement. But I think replacing Fish with Ted Danson has failure written all over this. I hope to be proved wrong, but I'm not holding my breath here. I'm just not feeling it at all with Ted Danson based on the promo. I will give the season premiere a shot and see if he can convince me to stick around. But I know I already miss Fishburne regardless if Danson is good or not. Okay, Ted Danson wasn't as bad as I thought he would be. But he is no Laurence Fishburne...or William Peterson for that matter. Ted's character D.B. is a little to hippie-ish for my taste. Kind of flighty it seems. I will give him a few more episodes to find his CSI groove. But I'm not expecting anything near what we got with Fishburne's character of Ray Langston. They did tie up loose ends regarding Ray by talking about the fact that he was back together with his wife and they are working on their relationship, thus his exit from CSI. As for the rest of the episode, the secondary crime scene was almost an afterthought. They show the crime scene at the beginning, and then it's forgotten about and not wrapped up till the very end. Huh? I'll give them an A for effort with the deer hose angle. Pretty gooed episode using the "Strangers On A Train" murder plot of 3 strangers in a random meeting to commit the perfect crime. On CSI, there is no such thing as a perfect crime. Usually I can pick apart who did it inside of 10 minutes, but not here. I had no idea who it was until the end. I'm trying to remember if CSI Vegas ever used the "Strangers On A Train" angle before. In my mind, I'm saying yes and more specifically, it took place within the first 3 seasons, back when Grissom (William Petersen) was still around. ...as soon as they introduced the kidnapped victim Colleen, as the only survivor from the Gina and Todd Murder spree. I think this episode could have been so much better if they had used multiple episodes to set up Gina/Todd's crime, ala The Miniature Killer arc that ran for an entire season. Cases like this always benefit from longer arcs instead of stand alone episodes. The Suicide by Chocolate crime was practically a throw-away from start to finish and I could have cared less how that one turned out. Even Kelly Hu was wasted here in a thankless role. So, after countless cameo's from Oscar Goodman, the Mayor of Las Vegas, they finally whack him. Almost. Lucky for him he always wears a designer suit that doubles as kevlar vest as well. The episode centers around Goodman opening the new Mob Museum. So what does it get to show for this? 4 bullets...that bounce right off him. This was kind of weak. Nothing really compelling or engaging. The stories this season have been....meh. Even though the show deals in brutal slayings and all that, this year it seem rather light and part of the problem falls on to Ted Danson's character. He is too aloof...safe...vanilla. That's one of the things I miss about Laurence Fishburne's character of Ray. There was a lot of dark stuff surrounding him. A lot of mystery. The only mystery that we have on Ted's character is that he keeps talking about his wife, who we have yet to see. My guess is that she is long gone, but he has yet to accept it and continues to live in denial. 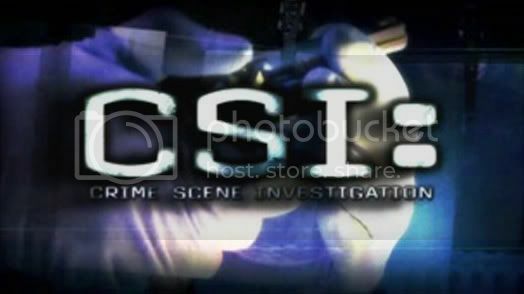 That's one of the best and definitely most entertaining episodes of CSI in a long time and one that's never really been done before. It had a pretty decent Special FX moment with the Copter getting shot down and crashing, follwed by a Gun Fight reminiscent of Heat. Kinda. But still something different. The theme of Kidnapping/Hostage continues this week here as Morgan Brody (Elisabeth Harnois) is taken hostage as the team races against time to find her and bring back home. I'm really staring to like the character of Morgan and I certainly dig the actress that portrays her. Very hot.